I’m so happy with how it looks, the color is different than anything I’ve picked before. The other bedrooms are white or gray, this room needed something dramatic and different. 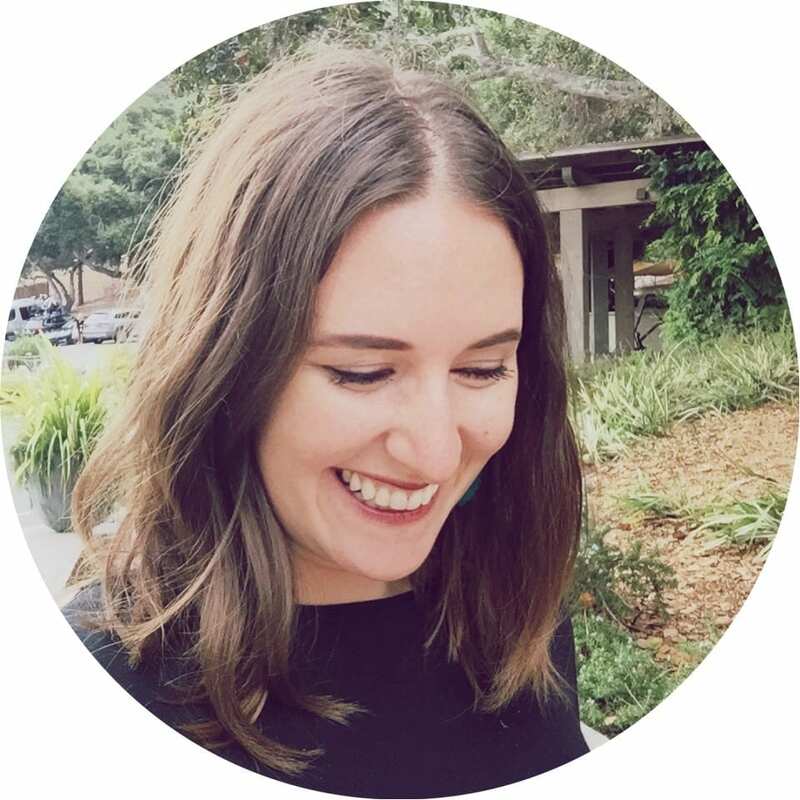 I’m no stranger to color, we have a hot pink rug and chair, our old home had colorful flowers on the wall and a turquoise front door – but the idea of going dark on a wall terrified me. Which is embarrassing to admit because it’s just paint, haha, but true. Here’s the room when we started, it had carpet, painted brown trim, beige walls, and non-planked ceilings. And it wasn’t bad! I would have been happy to keep this room as is for some time. We picked the room as our master because it was closest to the bathroom, had a large L shaped walk-in closet, and sat across the hall from a small 4th bed which would make a perfect future office/nursery. Many of you know we bought this house as-is, listed as a tear-down. It was far from “tear-down” condition, but needed a lot of work. 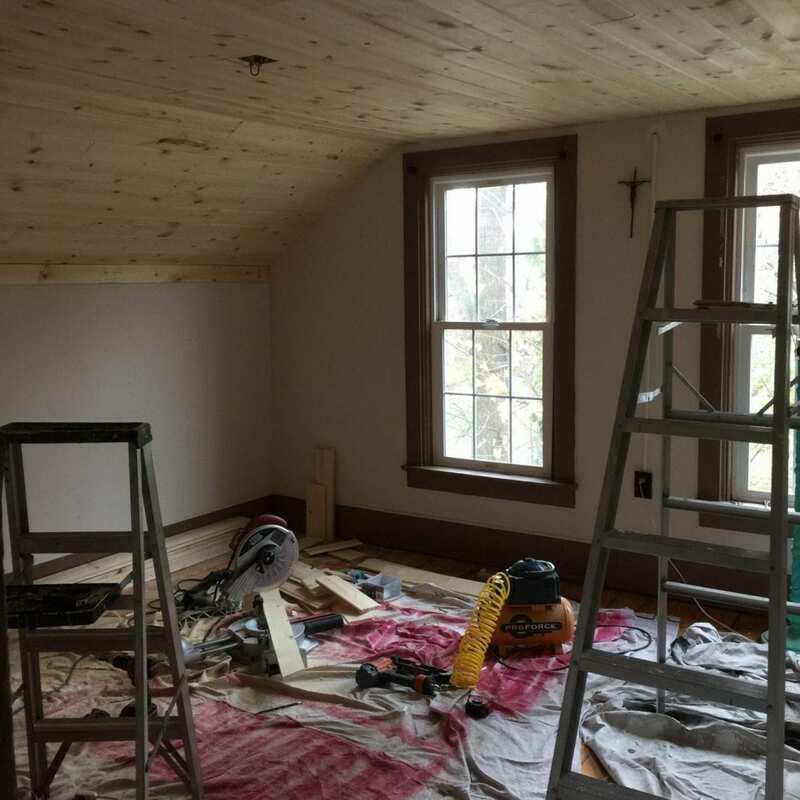 We decided early on we wanted to finish the second floor and bedrooms right away before tacking larger projects on the first floor. In our last two houses, the bedrooms were the last to get done. We thought working on this first would help us to feel more settled as time went on. After the other three bedrooms were finished (here’s the bright office remodel) we moved out for a week and had the pine floors refinished. 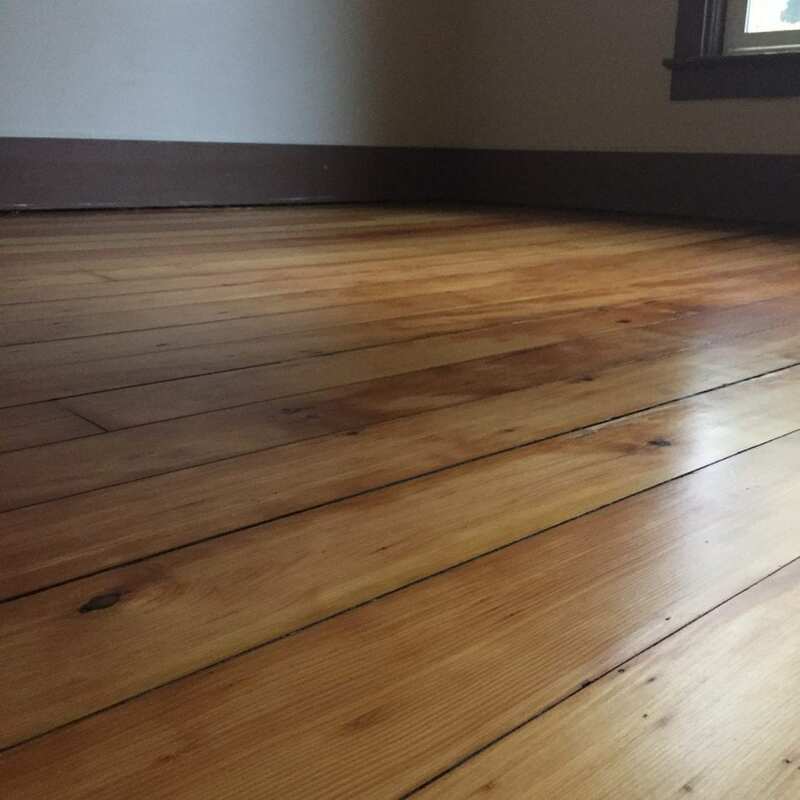 We didn’t use any stain, just sanded them and used three coats of satin polyurethane. This could (and will) be it’s own post – the before and afters are insane! Here’s the before of our master bedroom floor, the red carpet tiles were in the closet. And the floors after. 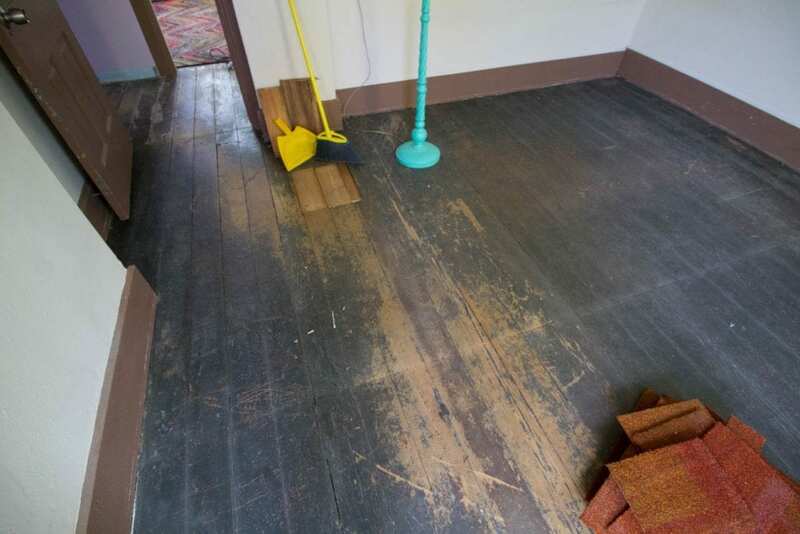 When we bought the house we didn’t know the condition of the floors – we were pretty set on just carpeting the bedrooms and uncovering this was like finding hidden treasure. 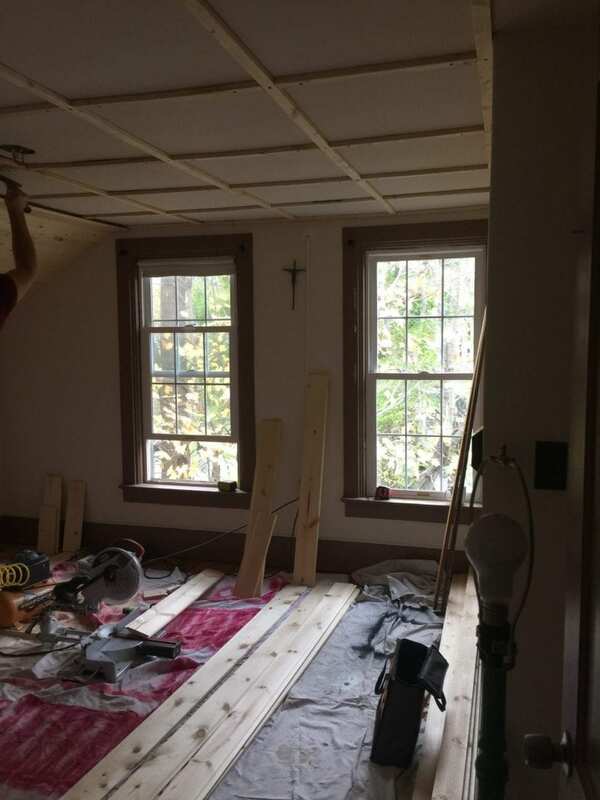 We planked the ceilings in the girls’ room and with the bright office makeover due to slightly damaged plaster ceilings. Our closet had similar ceiling tiles and damaged walls, we thought *eventually* we may have to plank those as well. Since it looked so good in the other rooms, and hey, this is our bedroom – so we decided to plank the ceiling in both our bedroom and closet. We hired Doug’s younger brother to help us finish the project quickly. 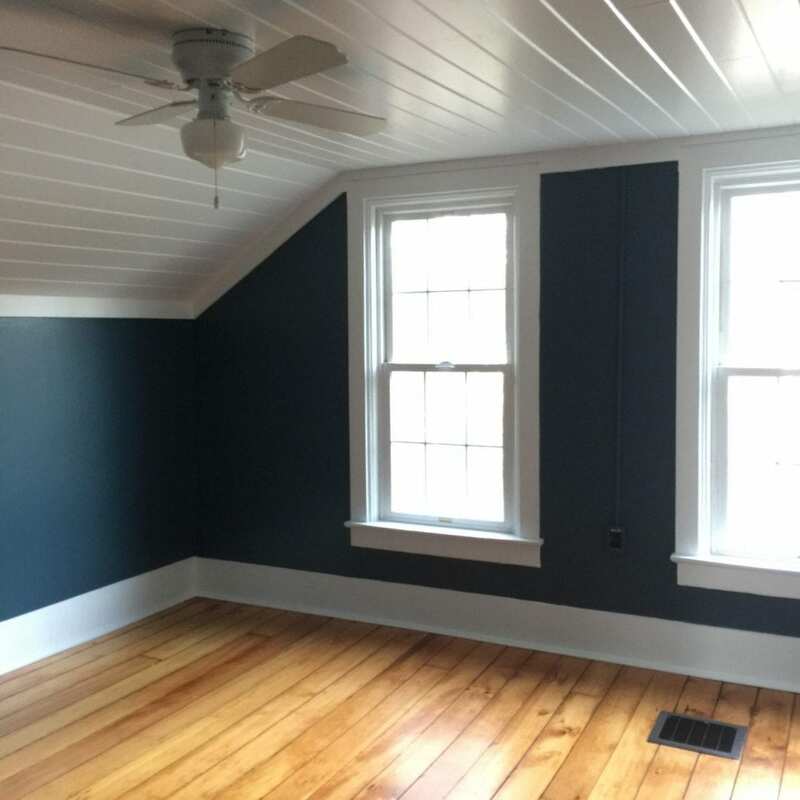 I went back and forth with the paint in this room – do I want light and airy like the other rooms, or should I try a dark, moody color on the walls? The girls’ room naturally has less light and I found myself spending more time in there. 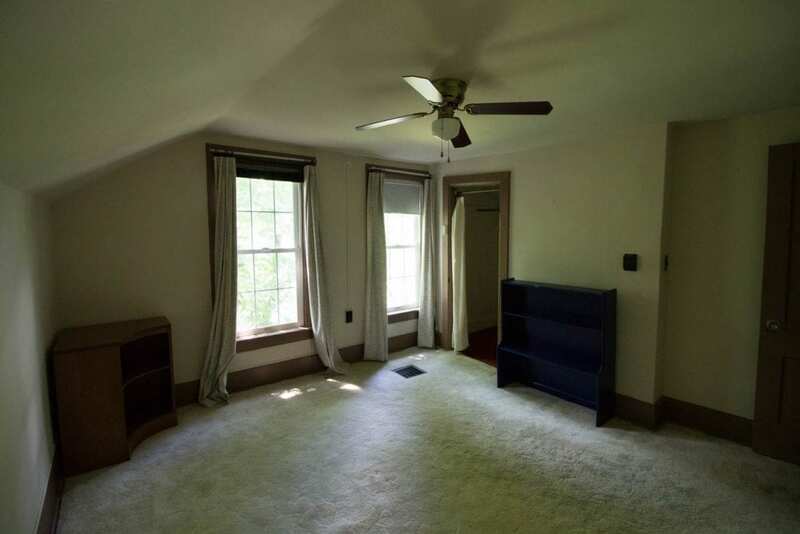 Plus, we had bright white ceilings, thick trim, and large windows so it wouldn’t feel closed in. So I went for it. Doug painted the ceiling and trim on a Saturday, we bought the paint Sunday morning, and it went up later that day. I missed most of the paint going up and went upstairs to see how Doug was doing, then posted this to Instagram and Facebook. Only one coat up and I was freaking out because I was SO HAPPY WITH HOW IT WAS TURNING OUT!!! In the morning, I rushed into the room to see the daylight streaming in. I still couldn’t believe it. 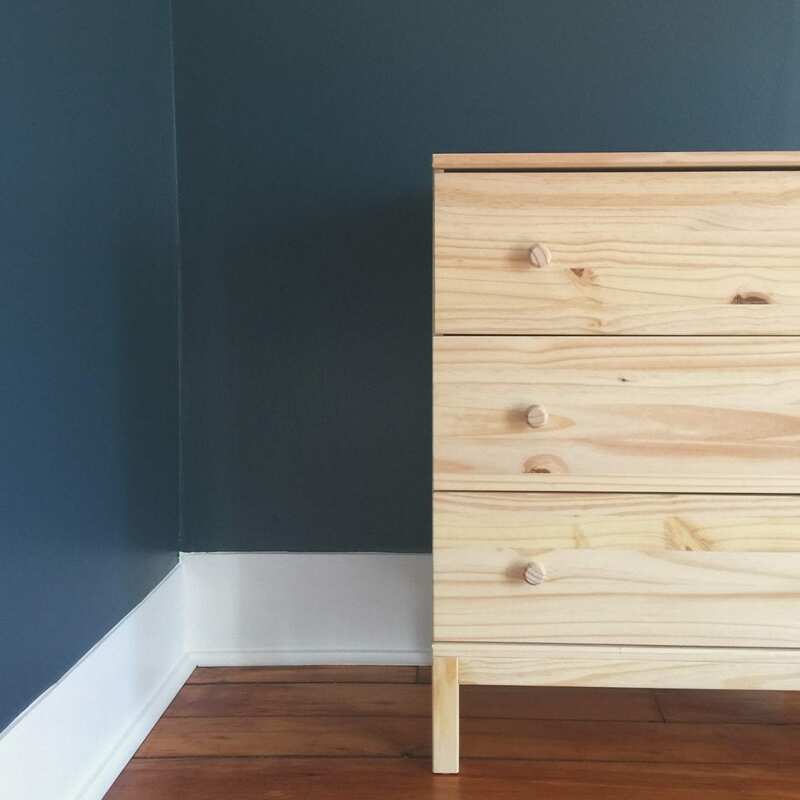 Yes, it’s just paint and we’re not the first people to paint a room this color but I can’t get over it! What do you think of the space, color, and transformation? If you want to see what we’re working on as it happens, follow me on instagram – @whitehouseblackshutters. It’s easy to share quick updates and answer questions over there, so that’s the best place to follow along if you’re curious what we are up to. Great job Ann Marie! Love the color. I am SO tired of neutral rooms. It’s like a plague. Congratulations on your beautiful home. I bet it has a lot of history. You should look into that. My little house was built in 1941 but definitely has some history. 1910 is a very interesting point in time. What a beautiful transformation. We are looking at homes for our move next summer and everything where we are headed seems so outdated. This gives me so much hope for what can be! I love the color! I tend to be a more white/cream/gray girl, but we finally bought our own home, which is definitely a fixer upper. So far one bedroom is purple…rock star girl (cream trim, cream tiles, crystal light), another aqua (cream trim and gold cove molding, cement floor for now…archaeology girl room, with accumulated worn antique furniture, including a ww2 field desk), and the third (and my fave so far), is a color called sweetpea. A deep green, custom dark stained trim, and dark floor with white rug, a waterfall furniture set from the 1940s, black and white pen and inks…it’s beautiful. For my college daughter who lives with us. 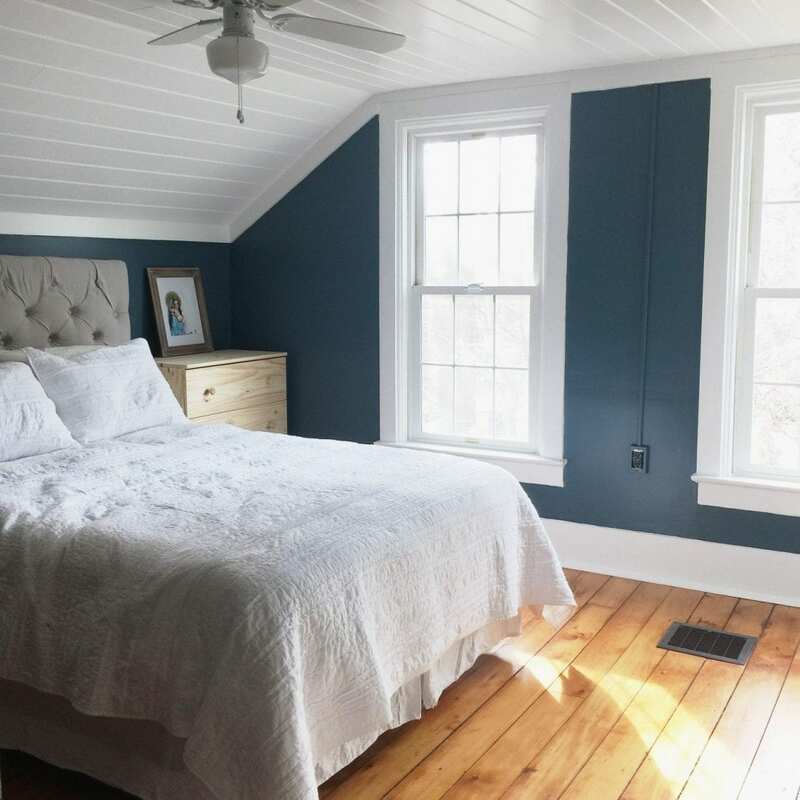 Next is my room…it will be Silvermist with dark trim, lots of windows, dark floor, no overhead lighting (unless hubs wins that argument…none there, yet). We started with the bedrooms and pantry, I’m anxious to see how it will turn out in the end 🙂 It goes slow, because I do all of it alone, unless the hubs happens,to be in town…once a month or so. Your bedroom is beautiful! I love the walls and in my mind I can see a quilt with little pieces of that color throughout the pattern. Sorry I sleep under quilts…you are inspiring me to think about my bedroom walls.